Elematic Acotec is a fast and profitable production technology for light, non-load bearing, room-high partition wall panels, Acotec panels. The line covers the entire production process from concrete batching all the way to storage yard management and beyond. The Elematic Acotec production line offers low operation costs and partition wall panels of the highest quality as the industrialized production process translates into precise panel dimensions and flat panel surfaces. 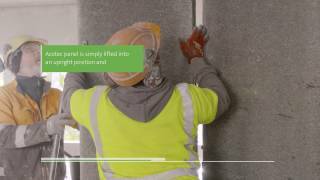 The Acotec partition wall panels are quick and easy to install – no plastering is needed at the construction site. Elematic is the original developer of the Acotec technology. The production line comes in three varieties of which you can choose from: SEMI, PRO and EDGE. These differ by the degree of automation and capacity as well as the required investment size. All the lines – SEMI, PRO and EDGE - are quick and simple to install, run and maintain and require only very limited land area. They are also all automated and very reliable as they consist of proven, standard components. Acotec panels are precasted, non-load bearing partition wall panels. They are room-high and 600-mm wide, with a tongue and groove design along the vertical edge.The panels offer time and labor savings of up to 50% compared to conventional partition wall building methods. Acotec partition wall panels are ideal for places where excellent sound insulation - RW 38 – 48 dB - is key, such as apartment buildings, schools and hotels benefit from this type of partition walls. They are also well suited to bathrooms, kitchens and shower rooms thanks to their top-rate moisture resistance. Acotec wall panels meet the strictest of standards and requirements in terms of seismic durability, moisture and fire resistance (EI30 to EI120). They are fully recyclable. The Acotec panels are fast, easy and safe to install. Building with them is 6 times faster than traditional brickwork and twice as fast as blockwork. Thanks to the industrialized production process, Acotec panels have exact dimensions and completely flat surface meaning that no plastering is needed. The surface is also hard-wearing and provides a secure base for any mounting fixtures. In addition, the structure of the Acotec panels is thin, leaving more floor space to use for other purposes in the building. Their cavities offer a practical duct for electrical wires and water pipes. FAST RETURN ON INVESTMENT Quick and simple to install, run and maintain. Requires only little factory space and land area. Possible to install in existing production facilities. HIGH QUALITY Industrialized production process translates into exact panel dimensions and flat panel surface. No plastering needed at the site. LIFETIME COMMITMENT Comprehensive service and support in installation, operation and panel usage. 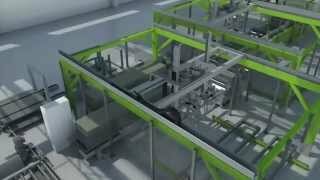 All Acotec wall production lines feature a new advanced production control system and a simple, modern user interface that shows detailed data on every function in the whole process. Various reports – on production rate, running hours and more – are also generated automatically. Modular structure of the lines and their integrated electricity with ETHERCAT bus system guarantee short installation and start up time of all lines, and the line can also be installed in existing production facilities. In addition, the Acotec production process is environmentally friendly as it is silent and non-vibrating, and the raw material can be recycled so no waste is created. Low energy consumption of the line keeps the production costs on a low level as well. The SEMI line, with a production capacity of 80 m2 per hour, is a simple line with practical combined restacker-handler and automated key functions. It is an excellent choice for anyone starting up in the business. The Acotec panel production process starts with choosing the right concrete mix. This is of paramount importance in achieving moisture‐resistant, fireproof walls with excellent workability. As a result, the panels can be sawn or drilled with ease. In the casting phase, concrete is poured onto thin base molds that support the product. The molds are automatically fed to the extruder where extrusion screws compact the concrete against a packing bar and sidewalls. The top surface of the product is compacted by a vibrating plate. The base mold length determines the standard length of the products. The base mold length determines the standard length of the products. After extruding, the products are cut to the base mold length. A circular saw cuts the fresh concrete at each base mold seam. The cut product together with a supporting plate is pulled to the stacker. The function is automatic. NOTE: Cover is open for display purposes. In actual operation the cover must be closed. Cut, fresh products are stacked into curing stacks. Depending on product thickness and weight, each stack contains 4 to 10 products and base molds. Stacks are supported by steel pallets, which are automatically fed underneath each stack. The stacks are moved to the curing area either by a pallet jack or a forklift. In overnight curing phase, the stacks stay in the curing storage in the temperature of min +10°C from 15 to 24 hours for natural curing. The product stacks are moved in and out of the storage area with a forklift, a crane or automatic conveyor lines. In Acotec SEMI, a smart, combined and automatic Restacker-Handler takes care of both operations; restacking and plate handling. The products are restacked to form delivery stacks of 4 to 10 products on top of each other. Elematic Acotec features straight, custom-made plates of high quality Finnish rolled steel that guarantee excellent precision of the panels and smooth, non-stop manufacturing operation. In order to keep the plates clean, they are fully oiled. Planarity check is automatic. After curing, the products are separated from the base molds and molds are sent back into circulation after passing through a cleaning and oiling unit. The cleaning and oiling function is manual. The PRO line offers a mid-level capacity of 100 m2 per hour with automated functions for all main processes: sawing, trimming, stacking, restacking, cleaning & oiling, plate handling and pallet circulation. The Acotec panel production process starts with choosing the right concrete mix. By using one of the recommended mixes, the result will be moisture‐resistant, fireproof walls with easy workability. The panels can also be sawn or drilled with ease. In the casting phase, concrete is poured onto thin base molds that support the product. The molds are automatically fed to the extruder where extrusion screws compact the concrete against a packing bar and sidewalls. The top surface of the product is compacted by a vibrating plate. If required, the fresh panel stops at a specified point, where the manually adjusted circular saw cuts off the wanted trimming piece. Maximum trimming length is 20 cm. The trimming piece is recycled back to the extruder. The trimming function is automatic. Elematic Acotec line offers easy recycling of rejected slabs and trimmed material. With a push of a button the concrete is returned to the extruder to be casted again. In Acotec PRO, stacking is automatic. Cut, fresh products are stacked into curing stacks. Depending on product thickness and weight, each stack contains 4 to 10 products and base molds. Stacks are supported by steel pallets, which are automatically fed underneath each stack. The stacks are moved to the curing area either by an automated conveyor system. In overnight curing phase, the stacks stay in the curing storage in the temperature of +10°C from 15 to 24 hours for natural curing. The product stacks are moved in and out of the storage area with a forklift, a crane or automatic conveyor lines. In Acotec PRO, restacking is automatic. The products are separated from the base molds and molds are sent back into circulation after passing through a cleaning and oiling unit. The products are restacked to form delivery stacks of 4 to 10 products on top of each other. Packing helps keeping moisture level stable and rainwater away from the product, meaning shorter on-site drying time and lower shrinkage. Stacks must stay in delivery storage for at least 14 days before being transported to a construction site. Elematic Acotec features straight, custom-made plates of high quality Finnish rolled steel that guarantee excellent precision of the panels and smooth, non-stop manufacturing operation. Planarity check as well as the whole handling and cleaning processes are automatic. The fully-automatic Acotec EDGE offers a top-rate capacity of 120 m2 per hour and needs only two operators to run. In addition to PRO's automation, EDGE features also automatic curing and packing as well as camera monitoring. In Acotec EDGE, the whole casting process is automatic. After extruding, the products are cut to the base mold length. A circular saw cuts the fresh concrete at each base mold seam. The cut product together with a supporting plate is pulled to the stacker. The cutting function is automatic. In Acotec EDGE, trimming function is automatic. If required, the fresh panel stops at a specified point, where the manually adjusted circular saw cuts off the wanted trimming piece. Maximum trimming length is 20 cm. The trimming piece is recycled back to the extruder. Automatic stacking stacks cut, fresh products into curing stacks. Depending on product thickness and weight, each stack contains 4 to 10 products and base molds. Stacks are supported by steel pallets, which are automatically fed underneath each stack. The stacks are moved to the curing area either by an automated conveyor system. Acotec EDGE features an automatic curing function. In overnight curing phase, the stacks stay in the curing chamber (T > 10 C) from 15 to 24 hours for natural curing. The product stacks are moved in and out of the storage area with an automatic conveyor lines. The insulated walls and roof of a curing chamber keep the heat and moisture inside, thus improving the curing conditions and quality of the panels. After curing, the products are separated from the base molds and molds are sent back into circulation after passing through a cleaning and oiling unit. The products are restacked to form delivery stacks of 4 to 10 products on top of each other. The function is automatic. Packing helps keeping moisture level stable and rainwater away from the product, meaning shorter on-site drying time and lower shrinkage. In Acotec EDGE, strapping and packing is an automatic, unmanned function. Elematic Acotec features straight, custom-made plates of high quality Finnish rolled steel that guarantee excellent precision of the panels and smooth, non-stop manufacturing operation. In order to keep the plates clean, they are fully oiled. Planarity check as well as the whole plate handling and cleaning processes are automatic. Fast, reliable and easy to maintain stationary extruder. Low noise (<85 dB), emission-free. Features 3 vibrators, compression and leveling equipment. Moving circular saw installed onto a roller conveyor. Sharp cuts, cutting speed 10 m /min. Adds flexibility to end products. With Trimmer, the product length can be adjusted by up to 20 cm for special needs. Fast and gentle stacking of panels. The system stacks the extruded products and their backing plates onto 4 to 10 piece stacks on steel pallets and transfers the pallets to procuring. Picks up finished products and feeds plates to extruder as well as separates B-quality panels. Simple, modern graphic user interface shows detailed data on every function in the whole process. Simple, modern graphic user interface shows detailed data on every function in the whole process. Ethercat-BUS makes line installation, operation and troubleshooting fast and easy. Simple, modern graphic user interface shows detailed data on every function in the whole process. Ethercat-BUS makes line installation, operation and troubleshooting fast and easy. Plate quality is controlled with sensors to ensure constant high quality. The modern control system assists in troubleshooting with visual indication of the location of fault and shows fault-specific instructions for corrections. Reporting function allows constant monitoring of capacity, raw material consumption and panel weight. Simple, modern graphic user interface shows detailed data on every function in the whole process. Ethercat-BUS makes line installation, operation and troubleshooting fast and easy. The modern control system assists in troubleshooting with visual indication of the location of fault and giving fault specific instruction for corrective actions. Thorough reporting tool helps to keep track of capacity, raw material consumption, panel weight, heat treatment, downtime, etc. Plate quality is controlled with sensors to ensure constant high quality. Picks up precured products and returns plates to the process. Stacks A-grade products into 4 to 10 pcs delivery stacks and separates B-grade products. Possibility to place curing chamber outside and minimize required hall space. Efficient recycling of rejected slabs and trimmed material guarantees low waste and decreases production costs. Concrete is returned to the extruder to be recasted. Efficient, unmanned strapping of panels. Automatic packing with plastic film. Improves the curing process and keeps rainwater out of touch with the panels. Panels can be equipped with safety wiring. Improves safety in panel installation phase on-site as well as during earthquakes as safety wire hinders loose pieces of concrete from falling down. Control cameras supervise the whole process and decrease the need for separate supervisors. Efficient cleaning and oiling of plates for high quality wall panels and long plate service life. The new feature on the Acotec production line, ATREX continuous crushing mixer, simplifies the Acotec partition wall panel production process and gives clear savings in production costs. With ATREX, lightweight aggregate of up to grade 30 can be directly introduced to the production process, instead of storing several specific grades and crushing and screening prior to usage. The continuous process also allows cement feeding according to production requirements, which decreases material loss. The ATREX continuous crushing mixer is available as an option on all Acotec lines.